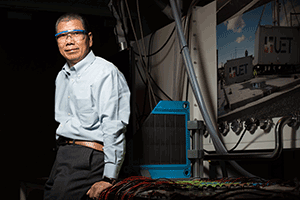 Jun Liu, materials scientist, energy storage expert, and Battelle Fellow, was recognized with the PNNL Laboratory Director’s Award for Individual Lifetime Achievement in Science and Technology. Liu has a rich history of achievements since first joining PNNL in 1992. His pioneering research has spanned cutting-edge programs ranging from fundamental studies of nanostructure materials and complex proteins to developing unique materials for the next generation of battery materials. He was named PNNL Inventor of the Year in 2013 and 2016, and a Battelle Distinguished Inventor in 2007. Liu’s leadership is internationally recognized. He serves as the director for the Battery500 Consortium, a $50-million multi-institute program aimed at developing the next generation of high-energy density batteries. He is also the president and co-founder of the newly formed International Coalition for Energy Storage and Innovation, which promotes collaboration among industry and academia. Liu has more than 50 U.S. patents and more than 400 peer-reviewed papers—of which greater than 60 are listed as highly cited papers by Web of Science. He has also been recognized as one of the top 1 percent highly cited researchers in chemistry and materials science from 2014 through 2018.